As energy costs and concerns for the environment rise due to the constantly increasing use of fossil fuels, there has been a push towards alternative energy sources and products with a low carbon footprint. Carbon emissions and the nation's dependence on dwindling fossil fuels can be drastically reduced by shifting towards renewable energy sources for transportation. Thus, the Electrical and Computer Engineering Department at Bradley University has launched a multi-year project to design a commercially viable urban electric vehicle with a minimal carbon footprint. The vehicle will be ultra compact, lightweight, and street legal. It will be large enough to hold two passengers and have a maximum speed of 65 mph and a sufficient range for a typical urban commute. It will also have all appropriate safety equipment. This type of application can be used throughout the world as a way for the daily commute to be much more economical. 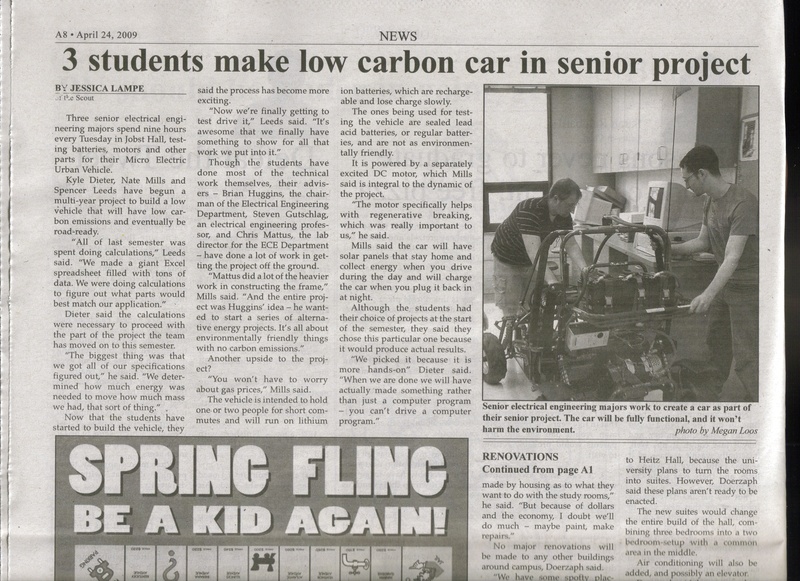 This project is the first phase of Bradley University’s Micro Urban Electric Vehicle endeavor. The goals of this phase consist of researching, designing, and implementing a test platform for a low carbon footprint, single passenger, electric urban vehicle prototype. The test platform will be designed to have a maximum speed of 30 mph and operate for multi-hour test runs. It will also have all appropriate equipment to allow safe test operation. Additional functional requirements will be developed as part of the project. A major goal of the project is to research the available battery technology, motors, and electronics (the drive system) to implement the test platform and prepare for the prototype vehicle. 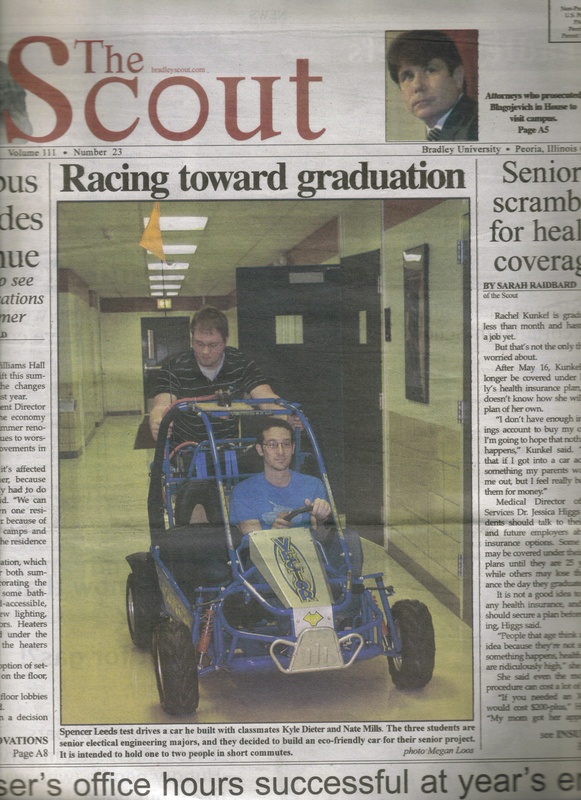 The MEUV has been featured in the Bradley University Scout! To see scans of this article, click below. Copyright © 2008 - 2009. All Rights Reserved.